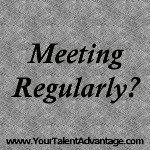 It is not surprising that meetings have a bad name among business partners and in businesses in general. Much too often, not a lot gets accomplished. They are boring, time consuming and sometimes emotions take over when disagreements come up. And yet, as a coach to businesses I insist that partners meet on a regular schedule and also with their teams. Partners who do not have regular ongoing scheduled meetings to clarify, plan and strategize are jeopardizing their very partnership and the business. What I know as a fact, when partners and departments within a business don’t talk to each other, at the very least, money is left on the table and eventually I get the call to rescue a dying partnership relationship. Tad and Jonathan were ready to quit when they called me. Each accused the other of not fulfilling the tasks they were obligated to do. As I am accustomed to discovering about partners when I receive this type of call, they barely remember the last time they met to discuss the business. Each does whatever he thinks he should and views the other as the problem when things don’t seem to work. It was mind boggling to hear that each had a slightly different picture of where they were and where they were going. As they worked separately without consulting each other, the space between their individual perceptions was widening. I started by facilitating the difficult conversation between them where I taught them how to listen to each other. They were grateful and amazed that they could have a conversation that left out the emotions. That brought them to the realization that their basic original desires and dreams for this business were still the same and they actually still liked each other. It became clear that the resentment that each of them was harboring about the other was the result of not communicating. Each was doing what he thought he should, but they were on separate paths. Tad was in charge of finances and the IT department. Managers of the various teams, design, production, marketing and fulfillment reported directly to Jonathan. But even the team managers didn’t meet and nowhere was the infrastructure to discuss how everything fit into the big picture of the original vision and mission the partners had planned. One of the greatest advantages of having a partner was ignored; having someone to share responsibility, brainstorm new ideas, and ongoing evaluations about what is working and what isn’t. Regular meetings with tight and useful agenda items keep the work of the business on track with the parts fitting together like a well-oiled machine. Overcome your habit of avoiding meetings and build in meaningful schedules to talk about the big picture and the details at least once a week. You have made a major investment of time, maybe money and your dream. Don’t let it fail. The relationship with your partners is the most important part of any business. It is dysfunctional when communication is unclear and irregular. Dorene Lehavi, Ph.D., transitioned her practice as a therapist to coaching, where she has over 20 years of experience as the recognized expert in business partnership relationships. She earned her doctorate at University of Southern California and MSW at Hunter College, NYC. Her mission is to reverse the statistic that most partnerships fail to most succeed. Dr. Lehavi is the creator of unique success oriented DIY tools such as the popular Business Partnership Agreement Templates. Learn more by visiting www.bizpartnerpro.com. This entry was posted in Entrepreneurs, Productivity and tagged agendas for meetings, avoiding your business partners, business meetings, business partnerships, meetings, partners don’t talk to each other, regularly scheduled, resolving disagreements. Bookmark the permalink.